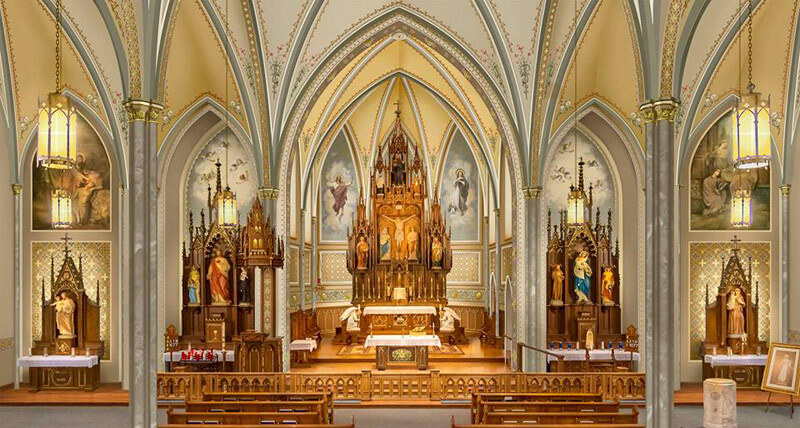 Photos: Conrad Schmitt Studios, Inc.
St. Columban Catholic Church is one of the oldest and most historic parishes in the Diocese of Kansas City-St. Joseph. 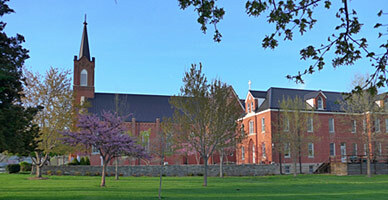 Founded in 1857 by Fr. John Hogan, it soon became the hub from which many of the other surrounding parishes in north and north-central Missouri were later established. The current church was consecrated on November 23rd, 1879. By 1900, the church was expanded to contain its transepts and apse. 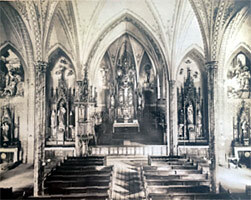 By 1913 side altars and murals were added. 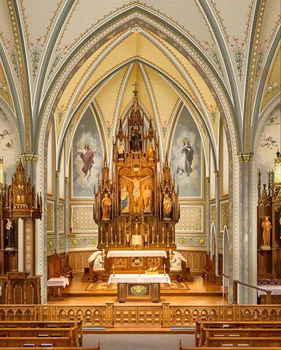 Once completed St. Columban's was considered one of the largest and most beautiful churches in northern Missouri. The parish will celebrate its 160th anniversary in 2017. Over the decades the parish interior has undergone many changes in design. While still overall beautiful by comparison, the design of the church did not live up to the potential the building was originally meant to have. The state of the interior had further been confounded by years' worth of water damage to the ceiling and walls. In 2014, the parish completed a replacement of the roof which had been a primary contributor to the problems inside. 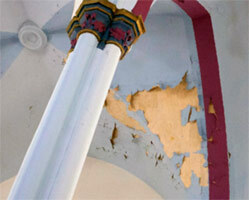 Though this important step was taken, the effects of the damage already done were still evident in the cracked paint and damaged plaster walls which were prevalent throughout the church. This vision recorded by St. John the Apostle is symbolic of the Church on earth, which is the new Jerusalem. This passage from scripture raises our minds to consider that just as the earthly Jerusalem held the Temple and God's presence within, so our churches also contain God's Eucharistic presence in the tabernacle. They are meant to be a little piece of heaven come down to earth. Thus our church's architect, Br. Adrian Wewer, incorporated both new and old elements of gothic architecture into its interior. Its pointed arches and high ceilings intentionally are meant to draw the eyes upward to contemplate heavenly realities. The many images of the saints present in the church remind us to follow the example of these holy ones and ask their prayers for us so that we too may one day be in heaven with God and them. 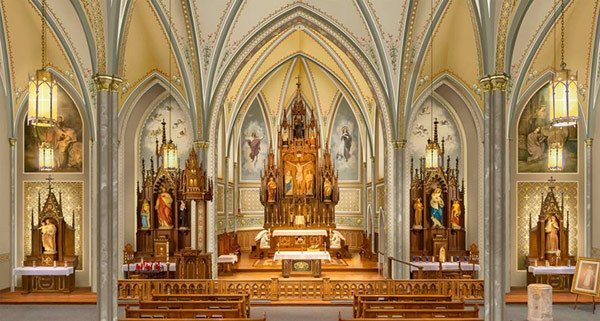 With an appreciation in mind for the lofty ideal the church interior is meant to inspire, efforts have been made to restore some of the beauty and sacredness that has been lost over the decades. The new design scheme proposed and adopted was heavily informed by the church's interior design at its height in 1913 while still incorporating some new elements. As such, it paid fitting tribute to the vision of Br. Adrian and our ancestors whose hands piously raised this parish church to be a radiant testimony on earth to the splendor of God above. 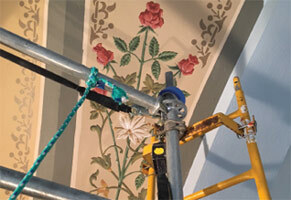 The restoration included: Plaster Restoration, Painting, and Decorative Painting. We have completed the interior restoration work on our beautiful church which will preserve it for generations to come and allow it to serve as a fitting house of worship to our God. To see the scope of what was accomplished, please come and visit the church in person or visit our Facebook page or our Restoration Progress page. However, we still need your help to complete our project. Donations may be mailed or brought to the church at St. Columban Catholic Church, 1111 Trenton Street, Chillicothe, MO 64601. Please make check payable to "St. Columban Campaign." Online donations may be made here! All contributions in the form of pledges should be paid by February, 2019. If you would like to make a donation using automatic withdrawal or have questions regarding the campaign, please contact the parish office at 660-646-0190. All donations are tax deductible by law and will be acknowledged in writing. If you have signed up for online giving, the merchant listed on your bank or credit card statement will be Vanco, not St. Columban Church. Vanco Payment Solutions securely manages our electronic payment transactions. Another option is to go to our Go Fund Me Page just established in June, 2017. Oh St. Joseph, Patron of the Universal Church, we place in you all our interests and desires. Assist us by your powerful intercession and obtain for us from your Divine Son all the blessings necessary to successfully complete the restoration of this church. St. Columban our patron, obtain for us the same wisdom, faith and love of God by which you overcame the obstacles that beset your path. Help us to live lives which glorify God that when our pilgrimage is over, we may share with you and all the saints in the joy of our heavenly home. >> Download our brochure here as a PDF file (approximate 7.0MB file). Brochure by: Conrad Schmitt Studios, Inc.